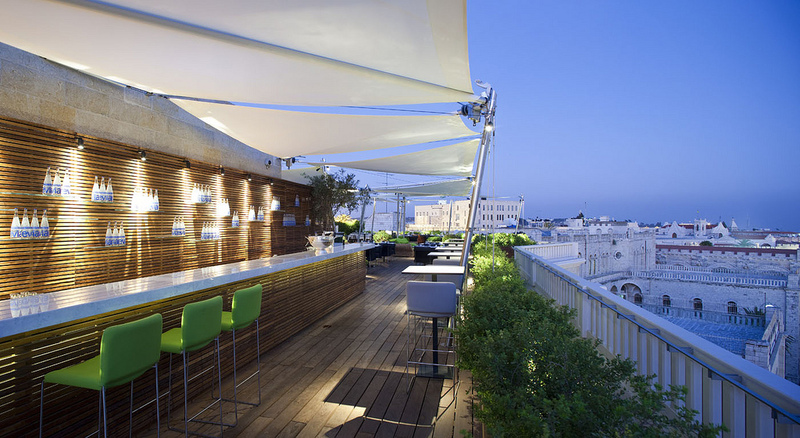 The wine bar has some twenty or so seats and is just outside the famous mirror bar and a few steps from the elevator to the rooftop restaurant in the Mamilla hotel, on the mezzanine floor of the hotel. As you look around and take in the ultra modern, minimalist, and sleek style of the wine bar, you can feel yourself starting to relax and as you start to settle into the atmosphere, you find yourself instinctively yearning for a fine glass of wine. Well, mission accomplished Mamilla Winery! The clear centerpiece of the establishment is the massive glass encasement of their cherished wines! There are as many wines there as one may well find at an upscale kosher wine store. However, here you will not find any of those filler wines, there are no wines here like Yarden Mount Hermon (a fine wine but second fiddle to the wine selection). Instead, according to Hadas, the winery is all about serving fine wine at a good price. Now, of course a good price is a highly subjective matter, but of the three wines I tried there, I found the prices to be quite reasonable. Remember, you are getting a chance to taste many wines that you would otherwise need to open on your own or enjoy on someone else’s buck, which for many is rare enough. Since the day was yet young, I decided to take it slow and I ordered a glass of the 2009 Yarden Odem Vineyard Chardonnay. I have spoken often about this wonderful golden nectar. Not of this particular vintage, per say, but of the consistent enjoyment I find when drinking this wine. The wine is clearly oak aged, but it is consistently a wine where Yarden takes a minimalistic approach in terms of oak and fruit manipulation. While sipping the golden juice, I asked Hadas about the selection of wines that the bar consistently stocks. She explained that originally, some two years ago, the winery stocked up on wines from Yatir and a few wines from the Galilee, like Yarden. As you look now at the glass-encased wines, purposely placed at eye level, you can quickly take in a wide swath of what I call kosher wine royalty. Sure there are many Yarden and Yatir wines, but there are also a wide selection of Binyamina, Barkan, Carmel, Hevron, Gvaot, and other Judean Hill wineries. 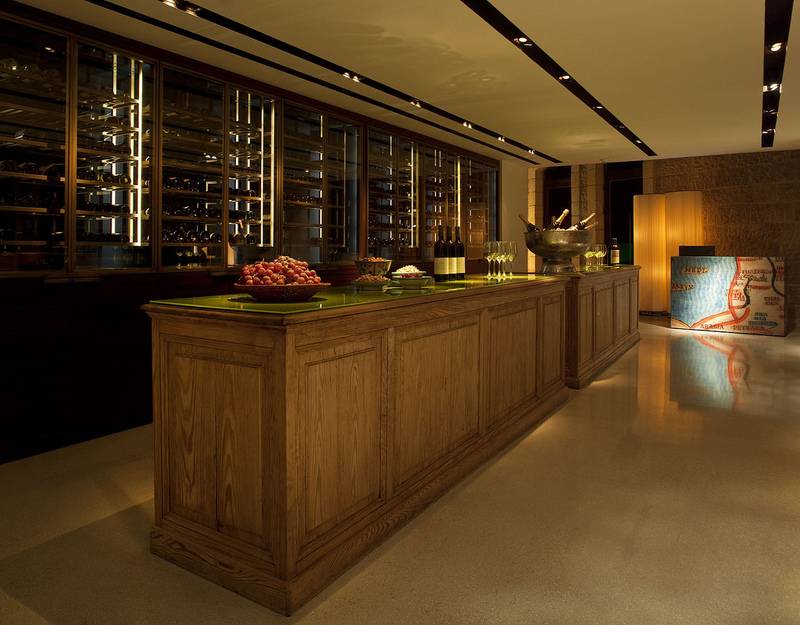 The desire is for the customer to feel relaxed in a hybrid wine tasting experience. This is not one of those posh upper class establishments who shun jeans and a tee-shirt (hey it was hot out there OK). Instead this is an establishment that thrives on being laid back yet upscale at the same time. 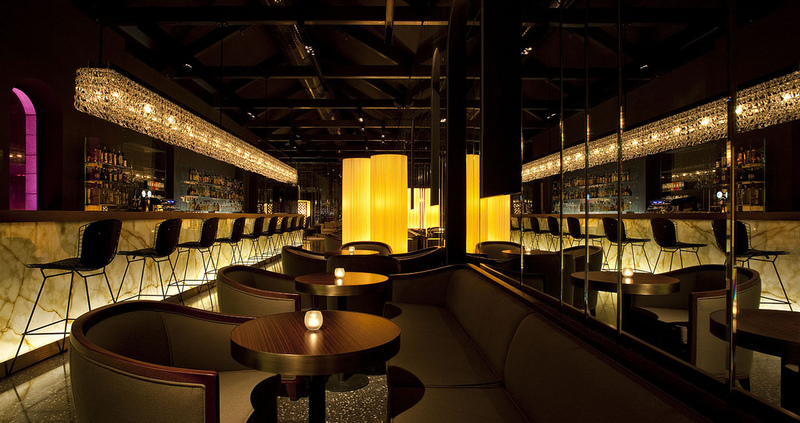 The wine selection, atmosphere, decor, and clientele all live up to that perfect hybrid experience. As explained earlier, the winery and wines are both feeders to the higher margin and more expensive food establishments that the hotel has to offer. Commonly, patrons will start at the wine bar and then take their glasses or bottles on to the restaurant where they happily continue enjoying them with their late lunch or dinner choices. The wine troves are raided by daily for the more discerning customers enjoying dinner at the citadel hotel or the Mamilla’s roof top restaurants. They are also available for Shabbat diners and special occasions, where the entire wine selection and wine bar can be wrangled into hosting your own wine event or party. My only take away is to make sure you call ahead to the hotel or winery to make sure they are open for when you hoping to visit and taste through some of their wines. The nose on this light gold-colored wine explodes with ripe melon, sweet apple, pineapple, nice minerality, and good spice. The mouth is full, rich and mouth coating, almost glycerol, with lovely ripe peach, melon, and freshly baked brioche, all wrapped in an envelope of toasty oak, sea salt and bracing acidity. The finish is long with cloves, spice, baked apple, almond, fig, and grapefruit. This is a wine that truly sounds like a shopping list, but actually it is really just a highly focused Chardonnay that uses deft hands when it comes to oak, while letting the fresh and ripe summer fruit take center stage, while accenting the play’s ambiance with spice and toast influenced clearly from oak extraction. The purple to black colored wine has lovely aromas that assault you at first, with smoky notes, tobacco, blackberry, ripe plum, loamy dirt, and bramble. The mouth expresses itself in an inky like and medium bodied structure, showing blackcurrant, cedar notes, date, and lovely soft tannins that come together quite nicely. The finish is long and spicy, with dark chocolate, mineral, and vanilla lingering along with green notes and tobacco leaf. The wine starts off hot and very akin to many of the second tier Cotes du Rhone kosher wines that were prevalent some 10 years ago, with searing alcohol and new world extra ripe fruit influence. The nose later opens to overripe date, raisin, cranberry, blackberry, black cherry, tar, and mineral. The mouth is searing with raspberry, black plum, and sweet cedar influence that helps to round the mouth. The finish is spicy with little other than more oak influence in the shape of chocolate, vanilla, sweet cedar, and black fruit. Posted on July 20, 2012, in Israel, Israeli Wine, Kosher Red Wine, Kosher White Wine, Kosher Wine, Wine, Wine Tasting, Winery Visit and tagged Barkan Winery, carignan, Chardonnay, Hevron Heights Winery, Israel, Mamilla Hotel, Mount Hevron, Odem Vineyard, Syrah, wine bar, Yarden Winery. Bookmark the permalink. 4 Comments. Currently in Jerusalem studying to become a chef. Thanks for the review. Can’t wait to check out this winebar!